Last year hubby and I painted the outside of our house and this year I’ve vowed to pay more attention to the garden spaces. Perennials need to be divided and moved around, weeds need to be kept under better control, our backyard fence needs to be replaced, and I need to redefine garden beds. I probably won’t get to all of it this year but maybe a decent dent can be made. 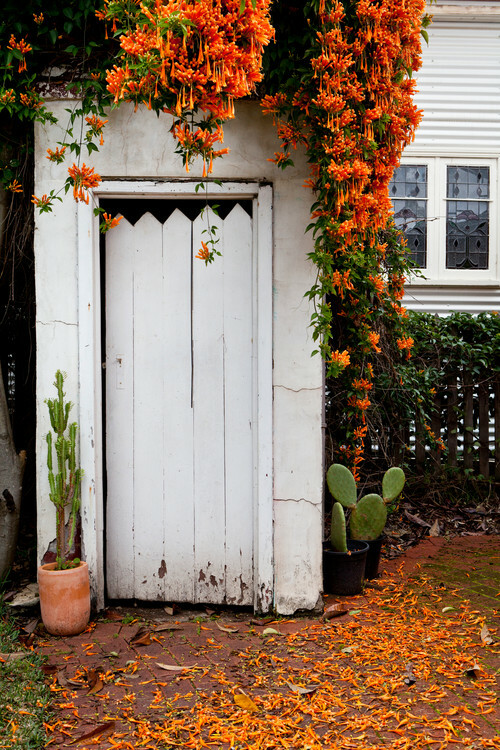 As usual, I turned to Houzz for inspiring garden ideas. When we painted our house, we cut the front bushes down and I’d like to replace them. I love this layered look of perennials in front of the house. It’s not as predictable as the traditional hedge of evergreen bushes. 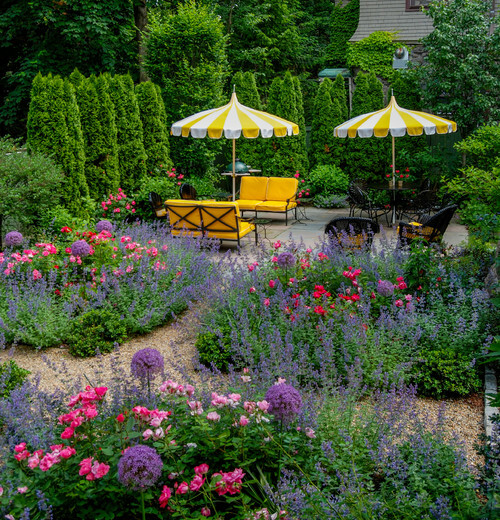 Traditional Landscape by Chicago Landscape Architects & Landscape Designers Heynssens + Grassman, Inc. I love the use of curves in this front yard landscape plan. Rather than the straight sidewalk to the front door, a brick walkway with curved edges carves the path to the porch. Large hydrangeas and a big pot of flowers add a soft touch of color. 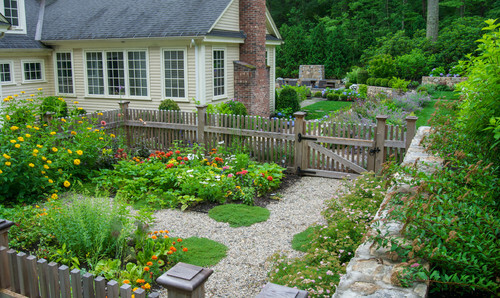 I love flower gardens like this backyard. Messy, a bit overgrown, and full of color! Landscape by Salt Lake City Landscape Architects & Landscape Designers Laughlin Design Associates, Inc. This spring garden is lush and appears to be never-ending. I have groupings of tulips and daffodils in the yard, but nothing quite like this. 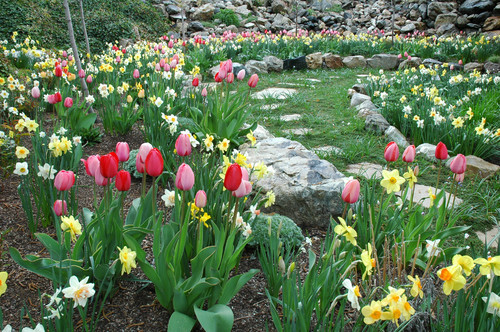 I’m making a note to plant more bulbs in the fall. 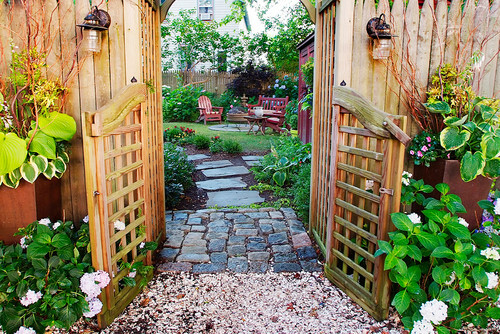 I’ve always loved the charm of a gated garden. It reminds me of New England. I could see planting beds of cutting flowers in a space like this. 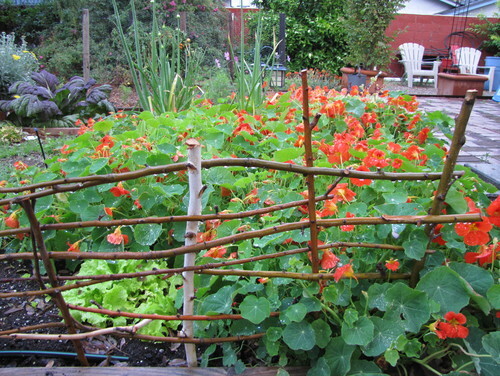 A fenced in vegetable garden is kept safe from hungry critters like rabbits and deer. I’m already planning what to include in this year’s veggie garden. I’ve always wanted a white garden, but that desire always gives way to a riot of color. In the summer, my motto is that you can’t have too much color in the garden. Landscape by Canton Landscape Architects & Landscape Designers The Carter Rohrer Co. 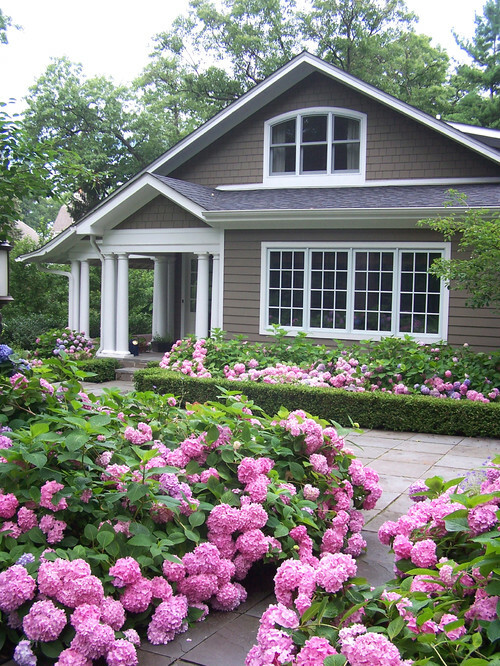 This house is sure to stand out on the block, with its wave of pink and blue hydrangeas! Landscape by Novi Landscape Architects & Landscape Designers Great Oaks Landscape Associates Inc. 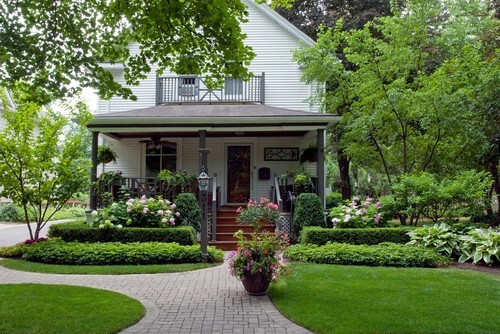 I love a house with a white picket fence in the front yard! 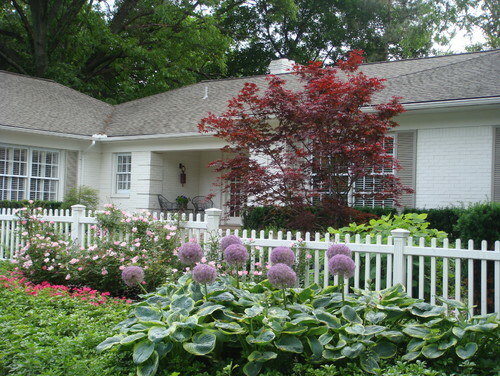 This one is especially pretty with its red-leaved tree, climbing roses, and row of hostas out front. This twiggy fence is a great way to use fallen branches … and we have a ton of those from the Silver Maples in our yard. This one corals edible nasturtiums. I’m a sucker for any type of flowering vine … Trumpet, Morning Glory, Vining Black-Eyed Susan, Clematis … you name it, if it vines it’s always welcome in my garden. Our walkways definitely need improvement around the house and I like the use of mixed materials leading through this backyard. We have a wooden boardwalk leading to our front door that I love. But now we need to turn an eye to the back and side yards and these inspiring garden ideas are motivating me to get to work. So stay tuned, I’ll be sharing our outdoor projects throughout the summer! 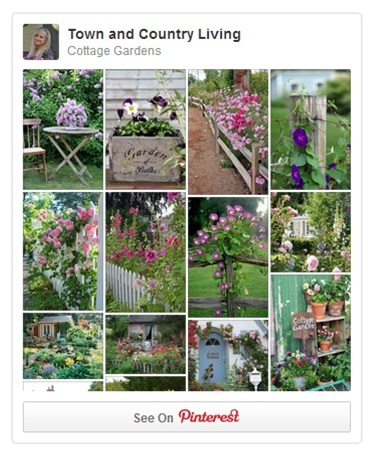 To see more inspiring gardens, visit my Cottage Gardens board on Pinterest! These ideas look great Jennifer. Can’t wait to see the fruits of your labours! I look forward to your blog every day, you are my favourite! I do so enjoy your blog but am I the only one who gets tired of the constant ads popping up and distracting from the content. Jennifer, I love this post! I love looking at pretty gardens. My back yard is NOT pretty! I love flowers and all, but I just don’t have the “green thumb” for it, I guess. Just trying to keep the weeds out is a chore for me. 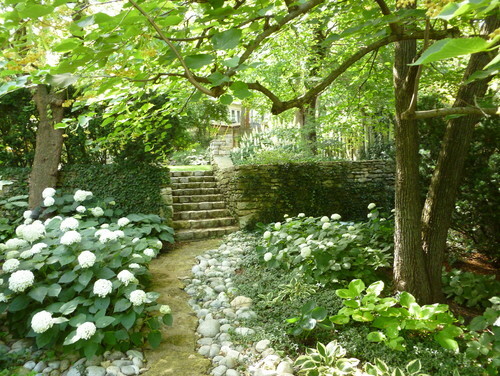 I wish I could afford to hire someone to come and make my yard beautiful like these on Houzz. 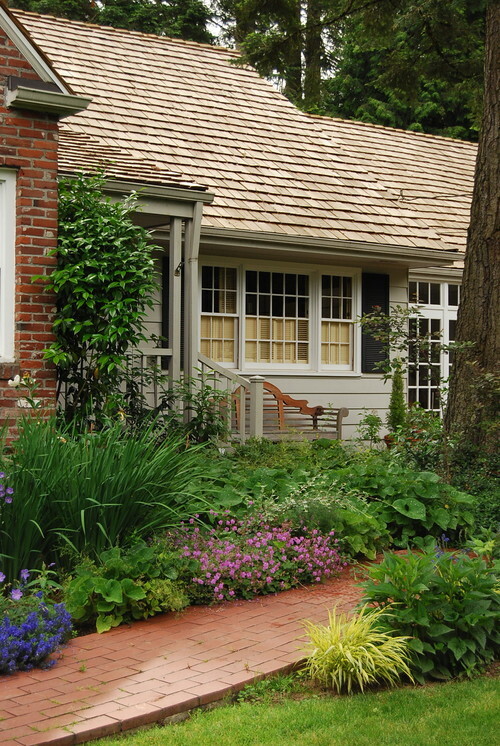 My favorite one is Landscape by Novi Landscape Architects & Landscape Designers Great Oaks Landscape Associates Inc. I just love white picket fences. I can’t wait to see what you do with yours!! Thanks for sharing! Great post, Jennifer. It makes me want to get out and dig in the dirt and plant some flowers. Thanks for sharing. Thanks so much for sharing these. That being said, I wish there was a way I could prevent my wife from seeing these. If she spends any time looking at these designs, I’m going to look like the biggest slacker. There’s so much you can do with even a little bit of land–it gets a little intimidating to face. But these are great ideas! Thanks! I agree with you that a gated garden looks great! I actually used to live in New England, and a lot of people that that kind of garden. 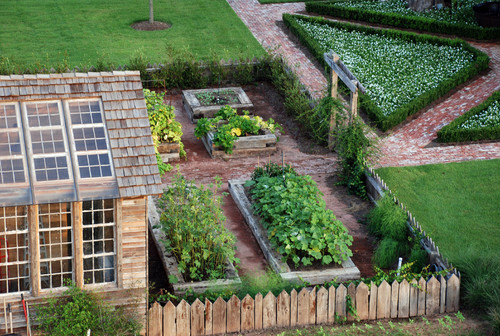 I think that my wife and I are going to try something like that with our garden. So, thanks for the pictures and the ideas! These ideas are definitely very inspiring. I love the last picture you have here, the gate leading into the lush green garden. The walkway is beautiful too, I really like the stone they used. We need to remodel our garden to look more like these.